Multi-operator tickets are available for 69% of bus trips, according to the latest National Fares Survey across Great Britain by the TAS Partnership. The figure varies by market, operating group and region. 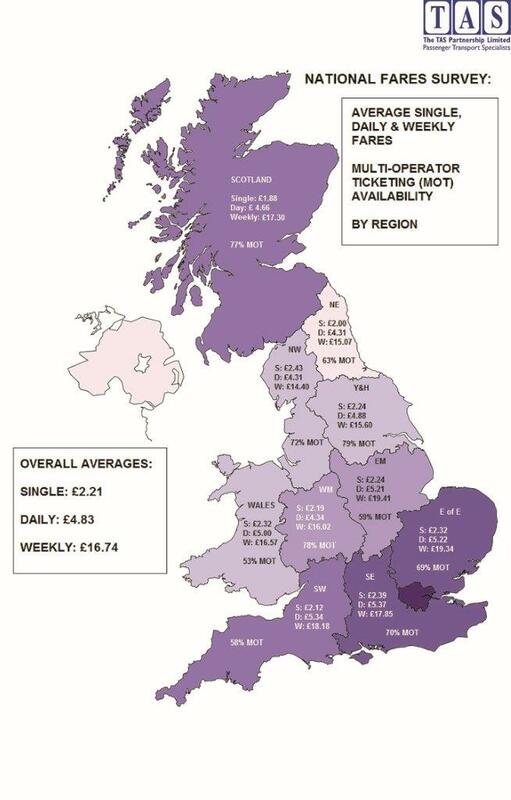 The National Fares Survey, published this week and covering fares gathered from October 2015, showed that multi-operator tickets are available for: 100% of trips in PTE areas; 74% of journeys across British cities; 52% of trips across Shire towns; and 43% of services across interurban areas. The survey also found that 70% of sample trips had a smartcard ticket option and were issued by participating operators, whilst 50% had a mobile ticketing option, a figure which will have risen since. Regionally, Yorkshire and Humber has the greatest availability of multi-operator tickets at 79% and Wales the least at 53%. Other key findings of the Survey included: while RPI has increased by 23% since 2009, the GB average adult single fare for a three mile trip in 2015 was £2.21, an increase of only 5% since 2013 but 26% since the first survey in 2009. The average day ticket cost £4.83, with the average weekly ticket in TAS’s sample costing £16.74. There is an average discount of 24% for those applying for weekly tickets.